What does success look like to an environmental activist? Sometimes success is obvious, like the protests against the Tasmanian Franklin Dam project. The protesters there were directly responsible for preventing the dam from being built and so protected a unique wilderness area. But sometimes success is less obvious. A battle is lost but, in the end, a war is won. Such was the case for the Daintree Blockade of the early 1980s. The Daintree rainforest of far north Queensland is every bit as unique and beautiful as the Tasmanian wilderness. But since the 1950s pressure had been rising to build a road through the Cape Tribulation National Park, and through some of the last remaining low land tropical rainforest in the country. The elimination of a significant part of Queensland’s wet coastal wilderness, extension of erosion in a highly erodable landscape affecting both mainland and inshore reef nature reserves, disturbance of flora and fauna including restricted species, and management problems related to habitat preservation and public use. A small group of local residents decided to take a stand, organising a protest which stopped work on the road. The blockade set off a clash of ideologies: greenies against developers, hippies against the local council, and anarchists against police. Wilkie’s well-written book immediately drew me in. He pulls together a complex array of material, stories and activities to tell a compelling story. We hear from the region’s farmers and business people, the local councillors and the protesting hippies. Wilkie’s research included over eighty interviews and intensive archival research and he delivers a significant record of an important social movement that, in the end, had international implications. In fact The Daintree Blockade: the Battle for Australia’s Tropical Rainforests is such a significant piece of research that it seems a shame Wilkie has chosen not to use footnotes or to provide an index. I fear this might cause problems for future researchers wishing to build on Wilkie’s excellent work. The text is beautifully produced. The book is full of evocative and fascinating photos and almost every page provides a feast for the eyes. In a significant coup, the book includes a foreword by Australian actor Jack Thompson – a key selling point that I think ought to be flagged on the cover of the next edition. It was a surprise to me to learn that The Daintree Blockade is the first book to be written about the protest, but given how successfully Wilkie has presented his material, I suspect other writers might now turn their focus onto other, similar examples of activism. The blockade failed – the road went through and the short term impact on the environment was as dire as expected. Runoff from the road affected the Great Barrier Reef and the integrity of a unique wilderness site was destroyed. In Council’s haste to push it through, that first road was so poorly constructed that the first celebratory motorcade to travel on it became hopelessly bogged and had to be painstakingly towed to safety, one by one. But the world’s attention had been drawn to the unique Daintree ecosystem and the result was – in no particular order, World Heritage listing, a tourism boom, and economic prosperity for the region. Wilkie’s important book reminds us all that these outcomes were never inevitable, and should never be taken for granted. 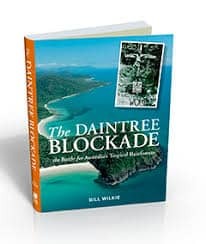 Buy the book at www.daintreeblockade.com.au and stay tuned – an author interview with Bill Wilkie is coming soon!